This desk comes complete with a hard drive storage area and key board table. The upper storage is perfect for all those important files. This desk comes complete with a hard drive storage area and key board table. The upper storage is perfect for all those important files. 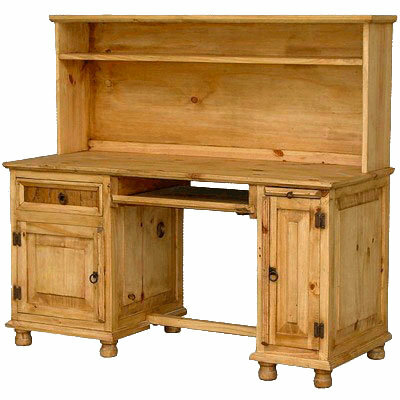 Features a small drawer that pulls out for your computer mouse or as a writing surface. Charming iron hinges and pulls complete the look. A great furniture piece for your Mexican office which can be stained in light, medium, dark, chocolate or even cottage finish to give your office that unique, stimulating flair which will help you feel happier ... and be more productive!